On Thursday, 9 Sept 1768—250 years ago today—Boston was charging into a political crisis. Edes and Gill’s Boston Gazette for Monday the 5th included an essay signed “Clericus Americans.” Harbottle Dorr attributed that essay to the Rev. 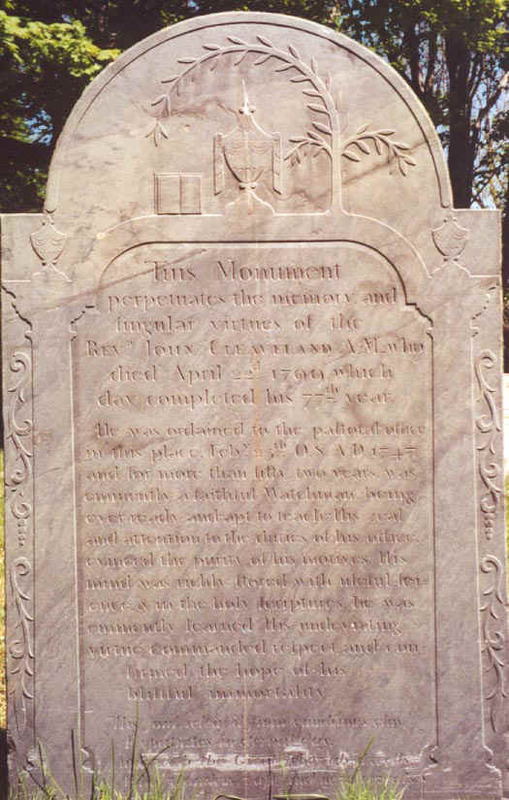 John Cleaveland (1722-1799, gravestone shown here) of Ipswich; Cleaveland certainly asked for it to be reprinted in the midst of another dispute a couple of years later. Cleaveland was an early adherent of the New Light religious movement, expelled from Yale College for attending a “separatist” revival in his home town. After spending a couple of years as minister to a small New Light congregation in Boston, he moved out to Ipswich to serve a breakaway group there. After that he left Ipswich only to serve as a chaplain in the French and Indian and Revolutionary Wars. In fact, Cleaveland proved so popular and steady that by 1774 his church absorbed the one it had split from. Whether the political union, connection, &c. &c. of these Colonies to the British empire and government are not hereby entirely dissolved, and the Colonists reduced to a state of nature? This was the argument underlying the Declaration of Independence eight years later. Cleaveland wasn’t arguing for independence—the letter ended with a plea for all colonists to pray for the health of the king and queen. But he did argue that Parliament’s taxation without representation, Gov. Francis Bernard’s early closing of the Massachusetts General Court for not rescinding the circular letter, and Customs officials’ rumored requests for army protection had delegitimized those government authorities. Cleaveland called for Massachusetts to start over: each town should “chuse Representatives for a general assembly” to maintain good government while the colony petitioned George III to restore its “first original charter,” with no London appointees at the top. In the Boston Gazette of the 5th inst [i.e., this month] appeared a paper containing a System of Politicks exceeding all former exceedings. Some took it for the casual ravings of an occasional enthusiast: but I persuaded myself that It came out of the Cabinet of the Faction and was preparatory to some actual operations against the Government. In this persuasion I considered that if the Troops from Halifax were to come here of a sudden, there would be no avoiding an insurrection, which would at least fall upon the Crown officers, if it did not amount to an Opposition to the troops. Bernard knew that army troops really were on their way. On 3 September, he had received a letter from Gen. Thomas Gage in New York, alerting him that on orders from London he was moving the 14th Regiment of Foot from Halifax to Boston. Gage also offered to send the 29th Regiment if Bernard wanted it. I therefore thought it would be best that the Expectation of the troops should be gradually communicated, that the Heads of the Faction might have time to consider well what they were about, & prudent Men opportunity to interpose their advice. I therefore took an occasion to mention to one of the Council, in the Way of discourse, that I had private advice that troops were ordered hither, but I had no public orders about it myself. This was in the 8th insta: & before night it was throughly circulated all over the town. On 9 September, the merchant John Rowe wrote in his diary: “The Governour told mee in Conversation Yesterday morning that he had Stav’d off the Introducing Troops as long as he could but could do it no longer.” Bernard also wanted people to understand that he hadn’t asked for army regiments, that the government in London had made the decision on its own. Some Bostonians, describing themselves as “apprehensive that the landing of troops in the town, at this particular juncture, will be a matter of great uneasiness, and perhaps be attended with consequences much to be dreaded,” petitioned for a town meeting. The town hadn’t met since June, right after the Liberty riot. The selectmen agreed, scheduling a meeting for 9:00 A.M. on Monday, 12 September—earlier in the day than usual, but time was essential. The Edes and Gill shop began printing official notices with that summons. Even before then, people started to act. On Friday night, Gov. Bernard wrote, there was a large but unofficial meeting “where it was the general Opinion that they should raise the Country & oppose the troops.” In other words, a significant number of people thought the town of Boston should call for the Massachusetts militia to rise up against the king’s army. TOMORROW: The beacon on Beacon Hill. The Rev. Cleaveland would appear to be a significant voice in the run up to independence, and there appears to be an unusually extensive collection of his papers at the P.E.M. 's Phillips Library, but I can't find any biography of him. Is there one? The World of John Cleaveland: Family and Community in Eighteenth-Century New England by Christopher M. Jedrey, published by Norton in 1979. Though I’m sure there’s more to discover.